Birds Of A Feather: We have a WINNER! Thank you to our wonderful readers (and new followers) for all of your comments. It paid off! We have a winner for the "Christmas Memories" candle. NEESHA ALLEN! 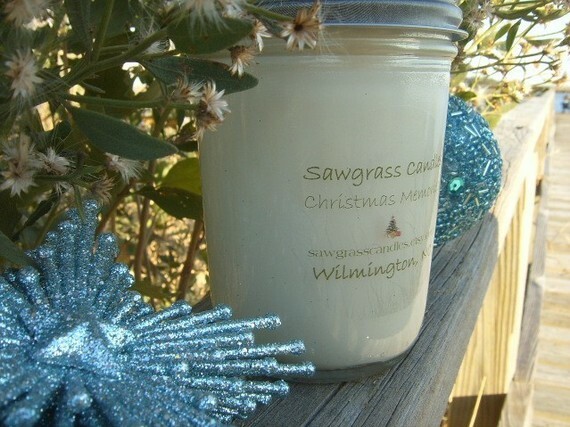 YOU ARE OUR LUCKY WINNER and can make some Christmas Memories of your own with this deliciously scented soy candle from Heather's fab Etsy Shop, Sawgrass Candles. Thank you Heather for your generous gift and Neesha, Merry Christmas and Enjoy! Ah yeah, good times. This was last year. It was 32 and snowing. And here we are just yesterday. That's me in the red bikini and Ann in white (and our hot husbands) as we grill out in the back yard. Ok, not really. The heat is getting to me (I'm a little delusional). It is going to be 73 today and sunny. Not quite feeling like Christmas, but perfect if we were celebrating the Fourth of July. I hope that wherever you are, you are making lifelong Christmas memories. Hoping you enjoy this last week before Christmas. Don't let the crazies getcha!